Here is Rainsplash...she's going on eBay tomorrow night. Click on her symbol for her page. The third one is still being designed...Cairistìona. This one's going to be a regal Celtic pony. 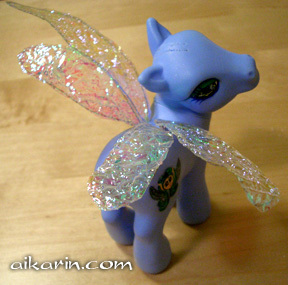 I decided to make this one instead of the super cute Easter ponies, since Hasbro already has a slew of them! Also, don't forget that the auction for Amber Wishes ends tomorrow night. XDXD I love Rainsplash's hair! It's soo pretty! And her eyes are so...exotic. Love her! Nice.. her hair makes me squee everytime I see it. Oh, I'm surprised that the accent mark on Cairistìona showed up. I just cut & pasted the name from a document. geesh. i just realized what an obnoxious block of text that was. gah. Thanks for adding me as a friend. ^_^ I usually use white colored acrylics as a base coat. I prefer the base coats, but some people will leave them out when painting a pony darker. Dyeing is probably easier, but it's not permanent. It's simply not designed to be. Don't be afraid to experiment. You could practice your techniques on fakies if you're not comfortable with real ponies. You can get them pretty cheaply at any 2nd hand store.